Lenstec Optical Group has been recognised as an Investor In People against the New Investors In People Generation 6 Standard, this recognition was awarded to the company in September 2017. To gain Generation 6 we are required to commit to the values of the company and make a clear pledge to continually invest in our staff so they feel valued and are able to grow and develop with the company. Also in September 2017 we have gained certification against Medical Devices Directive BS EN ISO13485:2016. This involved our production sites at Caerphilly and Bishop’s Stortford undergoing 10 days of audit by a certified body where all our procedures were rigorously audited. All Ophthalmic lenses supplied by Lenstec Optical Group comply with key requirements for Class 1 products of the Medical Devices Directive 2002. All lens packaging carry the CE marking and tolerances are in accordance with BS EN ISO 21987:2017 – Opthalmic Optics-Mounted Spectacle Lenses. We have an envious position in the Industry where training stands at the forefront of our culture. 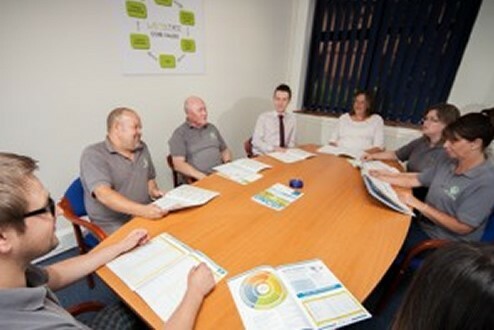 All staff commit to NVQ training and bespoke training geared to individual development. Our management are also trained to the highest standard. Our Quality Team under the leadership of Paul Kibble work tirelessly to improve our production methods and drive down wastage so we can deliver premium quality at a competitive price structure. A ‘no-quibble’ personal guarantee on all our products is core to our long-term relationship with you and your patients.